Can you spot my wallet? It's become an unfortunate routine around our house that you'll often find me racing around looking for where I've misplaced my wallet, phone or keys. Of course this normally occurs when I'm running late and have someplace else to be. Did my wallet get buried under some clothes on my dresser? Did it get tossed in the laundry? Is it buried under some files on my desk? I need to have my ID with me for work to get past security with my phone at the court houses I visit. As an attorney on the go without my iPhone accessible I'm at a real disadvantage because it contains my scheduling calendar and some important reference tools to make sure I'm always in the know. So it can be a bit stressful if I've misplaced either my wallet or my phone when there is someplace I have to be. So the Tile App has really come in handy since I've started using it. You'll never have to worry about misplacing your keys, wallet, or phone again with the Tile App which utilizes small Bluetooth devices to help you keep track of them. 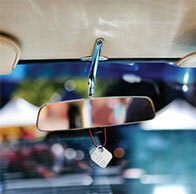 Attach a Tile to your key chain, place it inside a wallet, or attach it to another item you don't want to lose. Then download the Tile App to your smart phone. It is available for iPhones through the Apple App Store and for Android devices through Google Play. Once you've synced your mobile device to a Tile you can locate an object that your tracker is attached to whether it is in your home, left behind somewhere, or swiped by someone with sticky fingers. If the object is within your general vicinity the Tile App will ring it for you. This is how I've had the most use of this service so far. Open up the App and hit the find button associated with the object you are looking for. It is possible to use several Tiles registered to different objects on the App so you may have multiple items to choose from such as keys, wallet, or a briefcase for example. A map will show you the approximate geographic location of the object with the Tile so you can tell for example if you've misplaced something in the house or left it at some other spot you may have visited. For example, I'd gone out one evening to pick up dinner for the family and after going through the drive through left my wallet in the car. The next day I couldn't find my wallet and the Tile App was able to show me that it was in the parking lot where my wife works. Oh yeah, I left it in her car when I went out to get dinner the night before. Swung by there and picked it up before heading to where I needed to be. It is nice peace of mind to know through the Tile App that if you can't find something important like a wallet or purse that you'll quickly be able to determine if it got misplaced around the house or whether it is at a more distant location because it may have been left behind or stolen. When things are closer by, such as buried under clothes in your bedroom or files in your office the map function will let you know the object is in proximity to you but isn't detailed enough to let you know specifically where. So the App will ring your Tile for you. Your Tile will begin emitting a loud ringing noise when you get within 100 feet of it with your phone. I've quickly found my keys and wallet that I'd misplaced around the house on several occasion using this ring option. In the past, I might have spent a half hour or more tearing up the house looking for my keys or wallet and in similar circumstances with the Tile App it took me 5 minutes or less to find what I was looking for. Tiny speakers in the Tile emit a 90 decibel melody that is easy to hear even if it is covered by laundry or may be in another room. I'll be honest and admit that in addition to misplacing my wallet and keys I have a tendency to lose track of my iPhone. Another nice feature is the reverse ring option. Double click the "e" on your Tile and it make your phone ring, even if it is on silent mode, if it is within 100 feet of your tracker device. That feature is something I really love because of my clientele I'm in court almost every day and if your phone rings you get fined or have it taken away so mine is always on silent. It can be very frustrating trying to find a phone on silent because you can't call it and follow the sound. There have been times I've panicked due to not being able to recall if I may have dropped the phone while out and about, set it down somewhere and left it behind, or it just is someplace out of view around my house or office and knowing I can't call the phone to track its ring. I can now with the Tile App. That is so great! Each of these Tile device that can fit into the palm of your hand costs $25 and the app is free to download and use. The estimated battery life of a Tile is one year. Once you've purchased a Tile you can order replacements for each device you've bought at a discounted price. Tiles are shipped for free, have a 30-day guarantee and one year warranty. Do you know someone who has everything and is difficult to shop for? Get them a Tile so they don't have to worry about losing the stuff they do have. 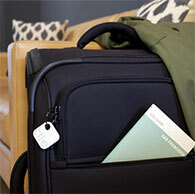 Tiles can be useful just beyond finding your keys, wallet, or phone. 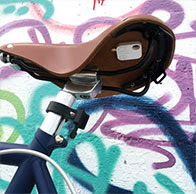 Place one under a bike seat for example and if your bicycle gets stolen it can help the police find it. Stick one in your car and if you forget where your parking space was it probably will be more useful than trying to beep your horn to find the vehicle. Our family has to carry EpiPens for food allergies - here's a story that our family can really relate to of how one family uses the Tile App to keep track of those which can be very expensive and are a necessity in an emergency. There are all sorts of ways these devices and app can be useful. 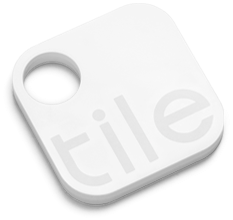 For more information or to purchase this product, visit thetileapp.com.